Check here to see these latest incidents and more as reported by the Mt. Laurel Township Police Department. On April 24 at 6:49 p.m., patrols responded to the 1700 block of Heatherstone Court for the report of damage to a vehicle. The victim/resident reports that while in his residence, he heard a loud noise outside. When he went to investigate the noise he observed a tire on his vehicle had been punctured. On April 24 at 3:58 p.m., patrols responded to the Laurel Creek Country Club on Centerton Road for a theft from two motor vehicles. The two victims reported that sometime between 2 and 3:30 p.m. on April 24, an unknown person(s) entered their parked vehicles and stole various items. A suspicious dark colored Honda Element was seen in the area but unknown if it was involved in the thefts. On April 23 at 6:18 p.m., patrols responded to a residence on Woodview Drive for a report of a bike stolen from an open garage. The victim/resident reported that two unknown juvenile males stole a Trek bicycle from her open garage. The bicycle was later found and returned to the owner. On April 23 at 3:58 p.m., patrols responded to a business on the 1100 block of Route 73 for a report of a fight in progress. 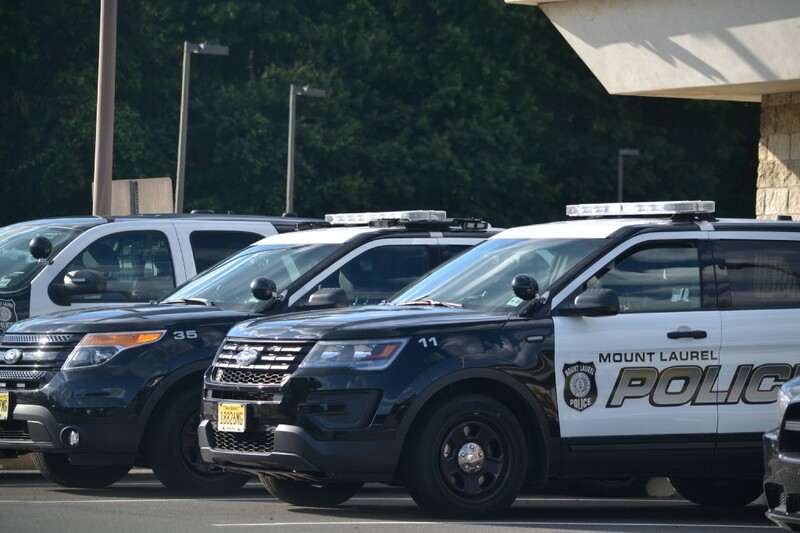 Investigation revealed a 21-year-old male and a 19-year-old male, both from Mt Laurel, got into an argument that turned into a physical altercation. On April 22 at 11:04 p.m., patrols responded to a residence on Hillside Lane for the report of a bicycle theft. The victim resident reported that unknown persons stole two bicycles from his open garage. The bikes were later located and returned to the owner. On April 22 at 5:12 p.m., patrols responded to a hotel on the 5000 block of Midlantic Drive for the report of a theft of an iPad. The victim reported that after checking out of her room, she realized that she forgot her iPad in the room. When she returned to retrieve the iPad it was gone. Her “Find my iPad” app showed the device still at the hotel. A short time later, the device was powered down and unable to be tracked. On April 22 at 3:12 p.m., patrols responded to a residence on Dewberry Court for the report of a theft of a tailgate. The victim/resident reported that an unknown person stole the tailgate off of his F350 pickup truck while parked outside of his residence. On April 22 at 2 a.m., patrols responded to a business on the 3000 block of Route 38 for the report of a fight in progress. The investigation revealed that a 32-year-old male from Pineville, La and a 22-year-old male from Sewell engaged in a mutual physical altercation after an argument. Both declined to sign complaints. On April 22 at 1:58 a.m., a patrol officer conducted a motor vehicle stop on Route 73. The motor vehicle stop investigation led to the arrest of a 32-year-old male driver from Maplewood for DWI. He was charged with DWI and related motor vehicle violations. He was processed and released to a friend pending a future court date. On April 21 at 7:08 p.m., patrols responded to the 900 block of Courtney Way for the report of a theft from a motor vehicle. The victim/resident reported that sometime between 7 p.m. on April 20 and 4 p.m. on April 21 an unknown person entered his parked vehicle and stole a video recorder. On April 21 at 3:03 p.m., patrols responded to a residence on Malvern Court for the report of a theft from a motor vehicle. The victim/resident reported that sometime between 6:30 p.m. on April 20 and 9 a.m. on April 21, an unknown person stole a cell phone from her vehicle that was parked in front of her residence. On April 21 at 6:38 a.m., patrols responded to a motel on the 1100 block of Route 73 for a report of an unconscious female. Patrols and paramedics responded and located a 22-year-old from Marlton unconscious and not breathing. Paramedics administered Narcan and the female regained consciousness. She was transported to an area hospital for further treatment. On April 21 at 2:51 a.m., patrols responded to the 2000 block of Grammercy Way for the report of a stolen motor vehicle. The victim reports that she parked her Acura in front of her residence on April 20 at approximately 10 p.m. When she woke up in the early morning, her vehicle was missing. On April 21 at 2:51 a.m., patrols located an occupied, suspicious motor vehicle on Wellesley Court. Investigation led to the arrest of a28-year-old male driver from Runnemede for DWI. He was processed, charged with DWI and released to a friend pending a future court date. On April 21 at 12:12 a.m., patrols responded to a residence on Williamsburg Way for the report of a male sitting in the victim’s vehicle. The victim reports that after seeing a male in his vehicle, he confronted him and a chase ensued. The victim was unable to catch the male, however, he did retrieve a cell phone that the male dropped when fleeing. On April 20 at 9:25 p.m., patrols responded to the area of Millstream Drive and Fulton Drive for the report of a motor vehicle crash. The investigation led to the arrest of the driver, a 69-year-old male from Mt. Laurel for DWI. It was determined that he lost control of his vehicle and struck two parked vehicles. The driver was charged with DWI and other motor vehicle violations. He was released to a friend pending a future court date. On April 20 at 11:23 p.m., patrols investigated a suspicious, occupied motor vehicle, in the parking lot of a motel on the 500 block of Fellowship Road. During the investigation, it was determined that a 24-year-old male from Easton, Pa was in possession of marijuana and drug paraphernalia. He was subsequently arrested, processed and released on a summons pending a future court date. On April 20 at 4:47 p.m., patrols responded to the Exxon on the 700 block of Centerton Road for the report of a theft of gas. The gas attendant reported that a black four door Kia driven by a female pulled into the station and requested $50 in gas. The attendant pumped the gas and the vehicle took off without paying. On April 20 at 3:13 p.m., patrols responded to a motel on the 1100 block of Route 73 for the report of an unconscious female. Upon arrival of patrol and paramedics, they located a 22-year-old female from Marlton who was found unconscious. Paramedics administered Narcan and the female regained consciousness. She was transported to an area hospital for further treatment. On April 20 at 1:30 a.m., patrols responded to the area of Route 38 and Marter Avenue for the report of an erratic driver. Patrols located the vehicle on Route 38. Investigation led to the arrest of the 32-year-old male driver from Mt. Laurel for DWI and other motor vehicle violations. He was processed and released to a family member pending a future court date. On April 19 at 10:19 p.m., patrols responded to the area of Elbo Lane and Periwinkle Drive for the report of a motor vehicle crash with an overturned vehicle. Investigation led to the arrest of the 23-year-old male, driver from Moorestown for DWI and other motor vehicle violations. He was transported to a local hospital for treatment and released to a family member pending a future court date. On April 19 at 8:16 p.m., a taxi driver came into police headquarters to report that he picked up a younger black female in Sicklerville who requested a ride to the 2000 building of Durham Court. After providing the transportation, the female exited the vehicle and advised that she would return with the $45 fare that she owed. The female did not return and was unable to be located. On April 19 at 4:31 a.m., patrols responded to the 100 block of Willow Turn for the report of damage to a parked vehicle. The victim/resident reported that an unknown person smashed the windshield of his vehicle with a brick, while it was parked in his driveway. On April 18 at 5:45 p.m., patrols responded to a residence on the 200 block of Starboard Way for a report of stolen packages. The victim/resident reported that two packages valued at $958.54 were stolen from her porch sometime during the day. On April 18 at 3:20 p.m., patrols responded to a motel on the 1100 block of Route 73 for the report of a theft. The victim accused the cleaning staff of stealing jewelry from her room. The cleaning staff denied any theft. On April 18 at 11:45 a.m., patrols responded to a business on the 200 block of Hartford Road for a theft. The employee reported that on April 16, an unknown person stole two packages out of his mailbox at approximately 12:16 a.m.
On April 17 at 6:40 a.m., patrols responded to the Laurelwood Development for the report of several vehicles entered overnight and items stolen. The incidents occurred on Heather Drive, Chatham Road and Winston Road. A total of eight unlocked vehicles were entered. Items stolen included money, GPS units, sunglasses and CD’s. Video surveillance from the area was obtained. On April 16 at 8:44 p.m., patrols responded to a residence on Holly Cove for a report of a male who overdosed. Upon arrival, patrols and the Mt. Laurel Fire Department found the male to be unresponsive and not breathing. CPR was initiated and Narcan administered. After some time, the 26-year-old male resident became responsive. It was determined that the male was passed out due to an apparent heroin overdose. He was transported to a local hospital for further treatment.